And once more we have a stupid meme. The quotation from Lincoln is out of context, and it would appear that Robert E. Lee never said this. Let’s start with Lincoln. In other words, for Lincoln, his primary duty was to uphold the Union. And, as any American historian will tell you, every action he took during his presidency was directed at exactly that goal. Slavery was not an issue for the Union, it was not why it went to war. That, of course, changed on 1 January 1863 when Lincoln’s Emancipation Proclamation came into effect. As for Robert E. Lee, there is no evidence whatsoever he said this. It is most likely that this fake quote is a mangling of something he did say or write, but I even have my doubts about that. Lee, of course, was the the Commander of the Army of Northern Virginia for the Confederate States of America, a failed statelet that existed from 1861-65. During its short lifespan, the CSA did not gain the official recognition of any other state. And it ended with the massive defeat of the Confederacy’s army. At any rate, Lee fought to preserve slavery. Full stop. Slavery was the primary reason for the secession for each and every of the Confederate states. It was also the primary reason for the existence of the Confederacy. Not states’ rights. Not taxation. Slavery. And this was what Robert E. Lee fought to preserve. So even IF this line from Lincoln could be extrapolated to mean something, and even IF Robert E. Lee said what this meme claims, it is irrelevant. One man ultimately ended slavery, the other fought to preserve it. But, the meme is not correct. It is FAKE NEWS. Nancy Isenberg‘s new book, White Trash: The 400-Year Untold History of Class in America, is attracting a lot of attention. No doubt this is, in part, due to the catchy title. White trash is a derogatory and insulting term, usually applied to poor white people in the South, the descendants of the Scots-Irish who settled down here prior to the Civil War, the men who picked up their guns and fought for the Confederacy during the Civil War. (Oddly, the term is not really applied all that often to poor white people in the North). I am also deeply suspicious of books that promise to tell me the “untold” or “true” story of anything. And certainly, if you asked American historians if class was an “untold story”, they’d laugh you right out of their office. But no doubt the title is due to Viking’s marketing department, not Isenbeg. This book purports to be a history of white trash in America. It is not. It is a series of recounting of what others have said about the lower white classes over the past 400 years. In most cases the author’s summarizations are a simple assertions of her opinion. The book is 55% text, 35% references and 10% index. The “Epilog” is a mishmash of generalizations of Isenberg’s earlier generalizations. Let us now parse Wiggins’ commentary. First, Wiggins complains that Isenberg simply summarizes “her opinion” and then generalizes her generalizations. Clearly, Wiggins does not understand how historians go about their craft. Sure, we have opinions and politics. But we are also meticulous researchers, and skilled in the art of critical thinking. The argument Isenberg makes in White Trash are not simply her “opinion,” they’re based on years of research and critical thinking. Second, Wiggins complains that the book is 35% references and 10% index. Of course it is, it’s an academic work. The arguments Isenberg makes are based on her readings of primary and secondary sources, which are then noted in her references so the interested reader can go read these sources themselves to see what they make of them. Revealing our sources is also part of the openness of scholarship. Wiggins’ review reminds me of Reza Aslan’s famous turn on FoxNews, where he was accused by the host of not being able to write a history of Jesus because he’s a Muslim. Aslan patiently explained to her over and over again that he was a trained academic, and had spent twenty years researching and pondering the life and times of Jesus. That was what made him qualified to write Zealot: The Life and Times of Jesus of Nazareth. Williams knows absolutely everything about any subject and is unafraid to hold forth against the received wisdom of 400 years of the scientific method, especially after four pints of Strongbow. Amongst his many accomplishments Simon is remarkably well-informed about optimal football formations, the effects of political events on international capital and bond markets, and the best way to pleasure a woman – possibly his favourite subject. His breadth of knowledge is all the more impressive as he doesn’t even need to bother spending ten seconds fact-checking on Google before issuing a firm statement. Yep. Personally, I’m looking forward to all the medical and public health experts at my local surgery being fired and replaced with Simon. Not to mention the car mechanics at my local garage. I’m sure with a little creative thinking (no research!!!) we can dig deeper and weed out yet more of the rot, too. See, experts can be useful now and then. And Nancy Isenberg is certainly one, given that she is T. Harry Williams Professor of History at Louisiana State University. Twenty-odd years ago, I took a course on pre-Revolution US History at the University of British Columbia. I don’t know what possessed me to do this, frankly. It must’ve fit into my schedule. Anyway, it turned out to be one of the best courses I took in undergrad. It was taught by Alan Tully, who went onto become Eugene C. Barker Centennial Professor of American History at the University of Texas. We read a bunch of interesting books that semester, including one on the early history of Dedham, Massachusetts. But, the one that has always stuck out in my mind is Laurel Thatcher Ulrich’s The Diary of a Midwife: The Life of Martha Ballard, Based on her Diary, 1785-1812. I remember being deeply struck by this book as a 20-year old in Vancouver. I had a pretty strong interest in women’s history as an undergrad, but this was one of the best history books I’ve ever read. In my last semester teaching at John Abbott College in Montreal, I taught US History, and assigned this book. I even got in touch with Dr. Tully to tell him how influential that course had been on me, and how influential this book had been and to thank him. I think he was chuffed to hear from me, even if he didn’t remember me (I wasn’t a great student,I barely made a B in his class). I am teaching US History to 1877 this semester and I have assigned this book again. Last time I assigned in, in 2012, my students, much to my surprise, loved it. And they loved it for the same reasons I do. Ulrich does an incredible job showing the size of Martha Ballard’s life in late 18th century Hallowel, Maine. Based on the singular diary of Ballard, Ulrich delves into the social/cultural history of Hallowel/Augusta, Maine, drawing together an entire world of sources to re-create the social life of Ballard’s world. I’m reading the book again for class, we have a discussion planned for today. I’m still amazed at how Ulrich has re-created Ballard’s world. And even if Ballard’s written English isn’t all that familiar to us today, 200+ years on, you feel almost like you’re in the room with Ballard. She has her own singular voice in my head, I feel like I know her. Writing history isn’t easy. It is a creative act, attempting to bring to life things that happened 10 or 200 years ago. We work from disparate sources, with multiple voices, created for a multitude of different reasons. They agree with each other, they argue with each other. And it’s our job to bring all of this together. In many ways, we’re the midwives of the past. The very best History books are like The Diary of a Midwife or E.P. Thompson’s The Making of the English Working Class: they bring the past to life. They make us feel almost like we were there. 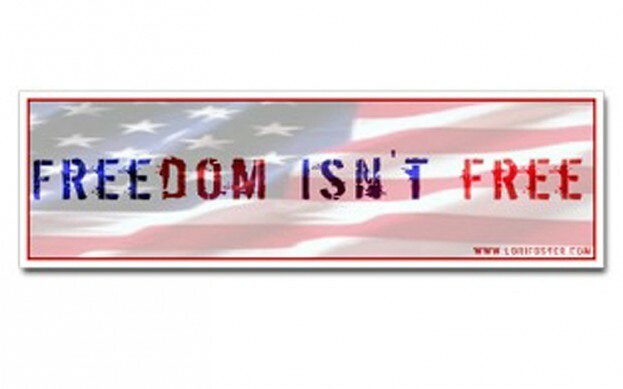 Here in the United States, it is common to see a bumper sticker that says “Freedom Isn’t Free.” These stickers pre-date 9/11 and the War on Terror and the devastating human cost of the wars in Iraq and Afghanistan. But they have taken on special meaning in the decade-and-a-half since 9/11. I am, as usual, teaching American history this semester. One of my classes is reading David Roediger’s classic book, The Wages of Whiteness: Race and the Making of the American Working Class. While Roediger’s attempts to connect himself to EP Thompson are perhaps overdone, he still makes a powerful argument about the centrality of race in the development of a free labour ideology in the US. He especially ties his argument to WEB DuBois’ conclusion in his Black Reconstruction of the psychological benefit the white worker received (in lieu of fair wages) through his whiteness, and its pseudo-entry to power. Even artisan-patriots with substantial anti-slavery credentials supported the Constitution as a compromise necessary to secure the world’s greatest experiment in freedom. Indeed. The freedom of white Americans, especially white American artisans/workers in the Revolutionary era came at the cost of the enslavement of African Americans. On one hand, Roediger seems to be letting these artisan-patriots off the hook. On the other, I have never quite understood the apparent lack of irony in the Revolutionary generation’s easy resort to slavery rhetoric to complain of Britain’s treatment of the colonies. I find it preposterous and disingenuous. And yet, this rhetoric became powerful during the Revolution. At any rate, as Roediger reminds us, freedom isn’t free. You are currently browsing entries tagged with us history at Matthew Barlow.